Reliance Games, a leading international mobile game studio, and Lionsgate, a leading global entertainment company, releases The Hunger Games: Catching Fire - Panem Run game for Android, iPad and iPhone. You can get the free game on the Google Play and iTunes App Store for Android and iOS respectively. We are proud to be able to give fans of The Hunger Games films an opportunity to immerse themselves in the game," said Manish Agarwal, CEO of Reliance Games. 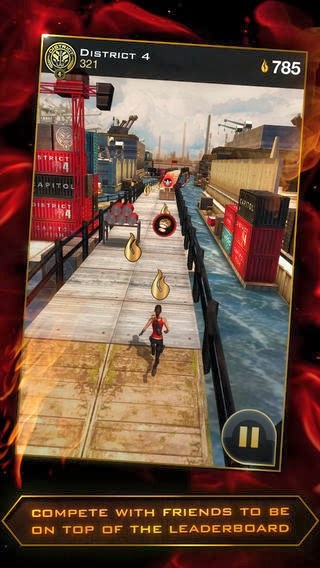 The new game Based on the upcoming film The Hunger Games: Catching Fire, which opens in theaters worldwide on November 22, 2013, The Hunger Games: Catching Fire - Panem Run game tasks players with running through the Districts of Panem, collecting Sparks and pursuing resources through the Districts. The game allows players to invite friends and fellow fans to see who can earn the most Sparks and bring honor to their District.